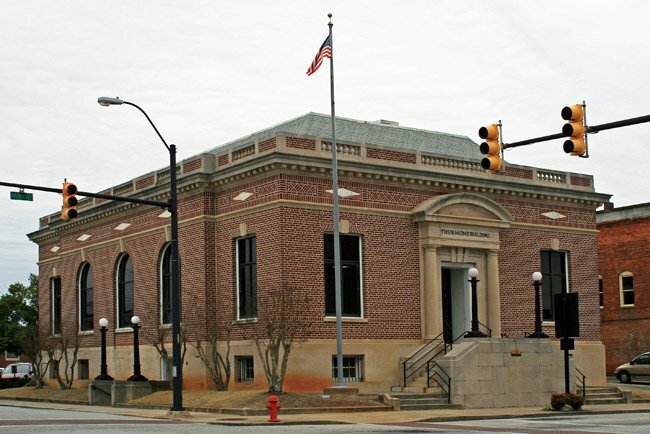 Historic downtown Union is home to this imposing brick edifice, built as a post office in 1912. Its design and construction were overseen by James Knox Taylor, Supervising Architect of the United States Department of the Treasury from 1897 to 1912. When the post office moved to a new building in 1965, the structure became the federal General Services Administration building. In the late 1980s the federal government, with the help of then-United States Senator Strom Thurmond, donated the building to the Union County School District. In 1987 the building was renamed the Strom Thurmond Educational Building in his honor. The school district currently occupies the building. 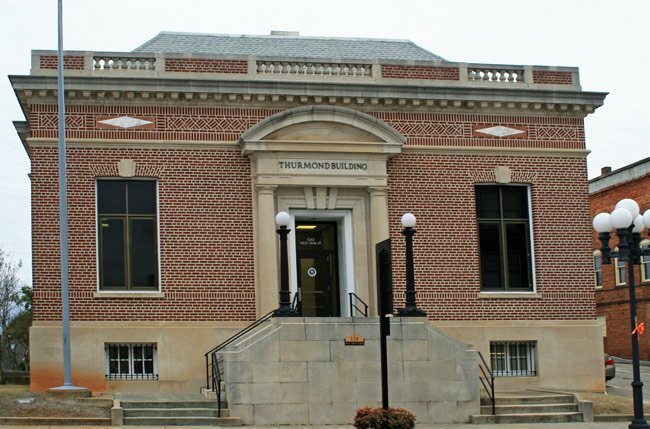 Notable features of the Thurmond Educational Building include triple keystones over the entrance and decorative brickwork with basketweave-patterned brickwork panels and diamond-shaped masonry inserts. Doric columns flank the entrance of the building, which measures around 4,000 square feet. The Union Downtown Historic District is significant as the public, commercial, and social center of the city of Union. It is significant as a collection of buildings associated with the commercial and governmental growth and development of Union from ca. 1878 to ca. 1940, with the majority dating from ca. 1880 to ca. 1930, a particularly significant period of commercial development in Union. The district is architecturally significant as a typical example of commercial and public building development and evolution in a small Southern Piedmont town from the late nineteenth century into the early twentieth century. The district includes commercial, public, residential, industrial, and transportation-related properties. Architectural influences include the Commercial as well as Neo-Classical and Victorian styles. The district is a collection of 72 properties, 46 are contributing properties and 26 are noncontributing properties.